We supply and instal turbo ventilator. Our company holds immense experience in this domain and is involved in offering wide assortment of Aluminium Ventilator. Usage/Application: Pull In Fresh Air And Exhaust Overheated, Moisture Laden Air. 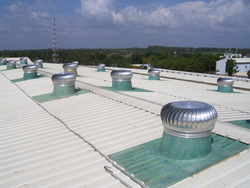 Air ventilators are provided to pull in fresh air and exhaust overheated, moisture laden air. Wind driven Turbo ventilators are powered by the wind to create effective ventilation for different industries. 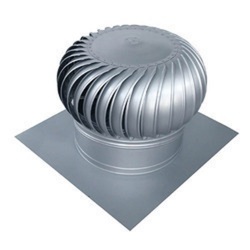 Turbine or Turbo ventilators are round metal vents with fins in them. Roof Ventilator Keeping the working environment clean, bright and airy ensures that the people working in the environment are able to do so without any hindrance; this results in better output. Our high performing ventilators have low maintenance cost, hassle free performance and provide maximal efficiency.